Before knowing its combination, we should need to know that how they work individually, so you know that Etoricoxib is Anti-inflammatory medicines (NSAIDs), used to relieve pain, swelling, and other symptoms of inflammation and Thiocolchicoside (TCC) is used clinically for its muscle relaxant, anti-inflammatory, and analgesic properties. Rheumatoid arthritis : Rheumatoid arthritis is a disorder in which joint cartilage becomes inflamed and, over time destroyed. Gout : Gout is a condition in which uric acid crystals accumulate within the cartilage of joints, resulting in extreme pain and inflammation. Osteoarthritis : Osteoarthritis concerns the gradual and irreversible degradation of the cartilage located within bone joints. Ankylosing spondylitis : In this disorder, the joints between the vertebrae in the spinal column come under attack by the immune system, and cause inflammation. Etoricoxib selectively inhibits cyclooxygenase 2 (COX-2). BEFORE TAKING THIS TABLET TELL THE DOCTOR ABOUT ANY MEDICAL PROBLEMS AN ALLERGIES THAT CHILD HAS NOW OR HAS HAD. This tablet is the combination of Etoricoxib and Thiocolchicoside and has unique duel mode of action i.e in this combination, etoricoxib used to treat orthopedic and thiocolchicoside used to control the pain and swelling. Drug interactions occur when it is taken with another drug or with food. Before you take a medication for a particular ailment, you should inform the health expert about intake of any other medications including non-prescription medications, over-the-counter medicines that may increase the effect of etoricoxib and Thiocolchicoside, so the doctor can warn you of any possible drug interactions. After combination of Etoricoxib and Thiocolchicoside we observed that Etoricoxib is selective inhibitor of COX-2 that decreases GI toxicity and is without effects on platelet function. Thiocolchicoside, is a muscle relaxant, which has been claimed to possess GABA (gamma-Aminobutyric acid) mimetic and glycinergic actions. It is used in the symptomatic treatment of painful muscle spasm. It has been demonstrated by recent studies concomitant administration of an Etoricoxib and Thiocolchicoside shows significantly better symptoms relief compared with the modest improvement of inflammation with each of the treatment alone. 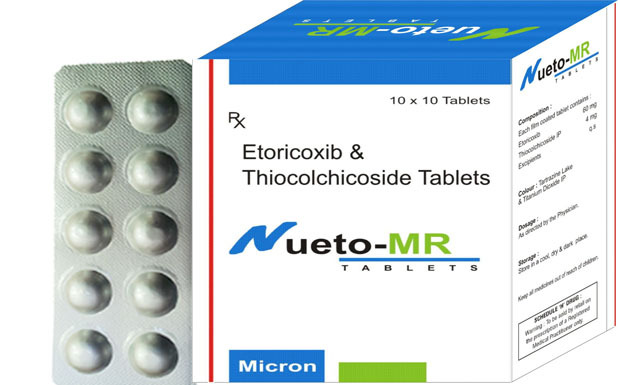 Side effects of Etoricoxib and Thiocolchicoside are most likely to be minor. Like Constipation, diarrhea, dizziness. If you suffer from serious side effects, then concern your doctor as soon as possible. Allergic disorders, coagulation defects; history of cardiac failure, left Ventricular dysfunction, hypertension, or in patients with oedema due to other Reasons; elderly, renal, cardiac or hepatic impairment. Inflammatory bowel disease, Severe congestive heart failure, Active peptic ulceration, Cerebrovascular disease, Lactation Children and adolescent < 16 yr.
From the above discussion, it can be concluded that this tablet is a new combination for a muscle relaxant and displays anti - inflammatory and analgesic properties and could improve the quality of life of adults with pain problem caused by Rheumatoid arthritis and others disorders.